Warlord Games has another bundle opportunity for you. This time it's letting you get the French Char 2C tanks for cheaper than buying them individually. Quite possibly the ultimate Bolt Action vehicle offer, the Super-size Me! 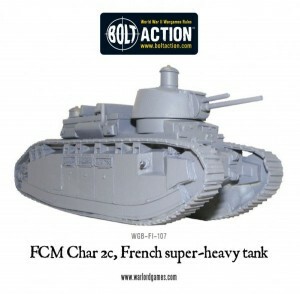 special offer allows you to buy all 10 of the colossal Char 2C FCM tanks that were made! Each Char 2C was named after an ancient French region and they became as famous as movie stars to the French public. Oh, did we mention you’ll save a bundle of cash with this deal?